Buy LA Girl Eyebrows online at Boozyshop. The make up webshop that makes online cosmetics shopping fun! Creating the perfect eyebrows is closer than ever! LA Girl has the best eyebrow products for extremely sharp prices. From eyebrowpencils you can draw beautiful natural hairs with to brow pomades where you can create mega tight eyebrows with: in the assortment of LA Girl you will find it all! First of all, you will find the Shady Slim Brow Pencils in the LA Girl assortment. With these eyebrow pencils you can perfectly sculpt, shape and fill your eyebrows. The super-fine pivoting tip ensures that you can easily draw little hairs with these pencils and work precisely. At the back of the pencil you will find a spoolie where you can then divide the product and get your eyebrows in shape. 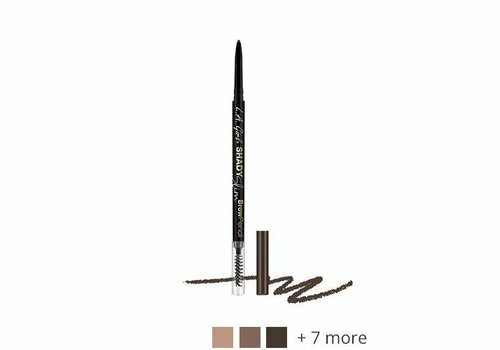 Shaping your eyebrows with this brow pencil is incredibly easy, making this technique suitable for everyone! Not only the LA Girl eyebrow pencils are of good quality, the brow pomades are also very popular and nice to work with! The creamy pomade is easy to apply and ensures that your eyebrows stay in perfect shape. The waterproof formula of the brow pomades is smudgeproof and longlasting so you can enjoy your beautiful and defined eyebrows all day long. A brow pomade from LA Girl is the secret for tight, perfect eyebrows! Eyebrows are one of the most important parts of your face. By creating the perfect shape and thickness of eyebrows that you want, you can ensure that you leave an unforgettable impression. In the eyebrow assortment of LA Girl you will find the perfectly suitable products you can shape your eyebrows with. From brow pomade to eyebrow pencil: you can find these products at a competitive price in the range of LA Girl. Order today for an amount above 30 euros and receive a free gift with your order. Do not wait any longer and go for fleeky eyebrows!